- Donald Richards Memorial Centre, Ghana. Does your health unit need our support? Madonna Clinic is located a short way off the main Kumasi – Accra Road, a 45 minute drive south of Kumasi. It is a small yet well-run clinic serving around 6,000 people. The staff team number 17 including 1 medical assistant, 1 pharmacy assistant, 14 qualified nurses and 3 competent midwives who all assist the Sister in Charge Sr. Ansah. Madonna Clinic has close links with nearby St Anne’s Clinic which is another of Inter Care’s partner health units – Staff from both clinics co-operate ‘covering’ each other in the case of absence. This tiny facility manages to fit 10 beds into four small wards for 120-200 Inpatient cases per month and, holds daily Outpatient clinics serving 10-15 patients per day including maternal child health, immunisation and general medical. 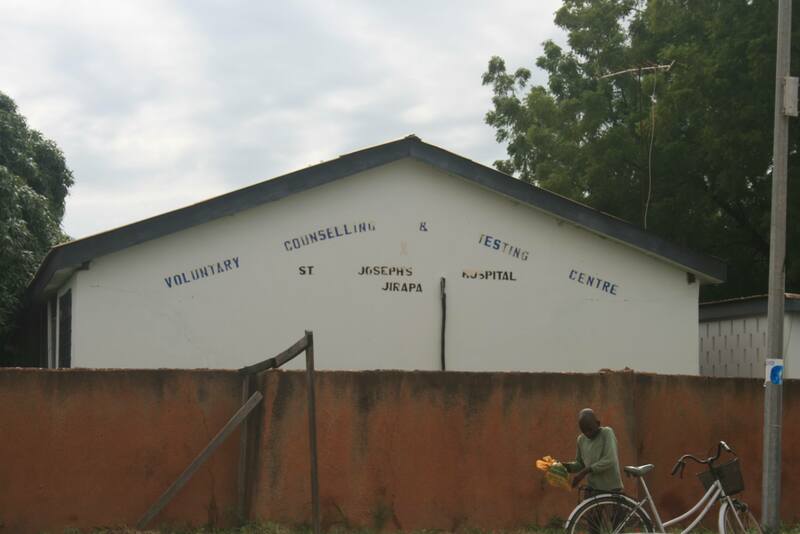 To sustain its services to the local population the clinic must be completely self-sufficient financially because it receives no government funding whatsoever and has no other support sources. When Inter Care last visited they proudly showed us the lab which we helped to provide. 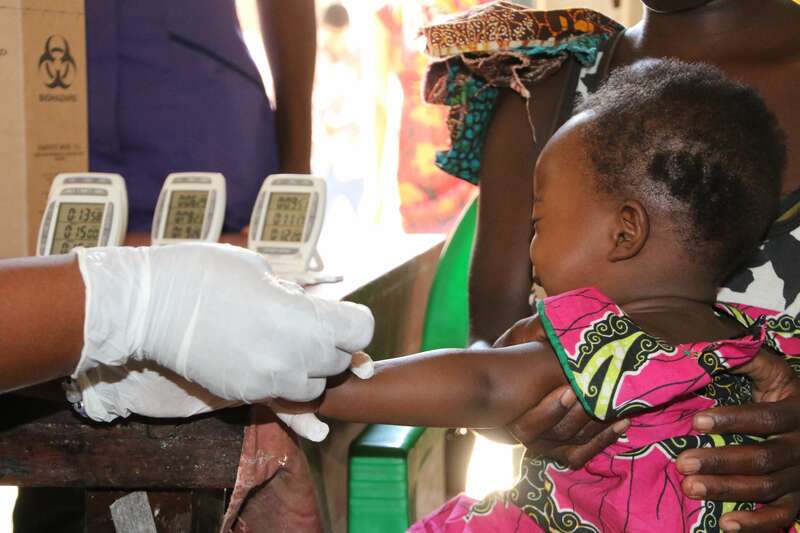 Staff can now test regularly for malaria, anaemia and perform urine analysis however, the lab had run out of HIV/AIDS test strips and were waiting on more from the government. They have difficulties with the cost of the transportation of the medicines they need so, to help them Inter Care bi-annually send consignments of basic medicines to treat a range of common conditions e.g. malaria, throat infections and intestinal worms. “Since the arrival of the nebulizers from Inter Care in 2017 we have been able to promptly attend to all patients that had to travel few kilometres to the nearby district hospital to receive emergency. Also, patients were able to receive Salbutamol inhalers which they are able to use at home when the need arises – These inhalers are quite expensive for the average Ghanaian. Overview – After a site visit in September 2010 Inter Care began supporting Kings Village with medical aid. A ‘model village project’ which opened in 1999 Kings Village is the brainchild of Ben, a Ghanaian Pastor and Marion, a teacher from Nottingham – both members of the Assembly of God Church. Ben and Marion have done a great job successfully funding the project and furnishing it with equipment and staff. It has gradually expanded to consist of a Hospital and nutrition centre, a school, a farm, and family housing. Medical – What started as a medical centre in 2006 with a team of 4 doctors and 2 students has since been upgraded to a 58 bed Hospital featuring emergency, male / female surgical and medical wards, also paediatric and maternity wards. They have an ultrasound machine and staff qualified to use it. The 112 strong staff team now consists of 1 doctor in residence, 1 visiting, 5 clinical officers, 4 medical assistants, a pharmacist, 6 pharmacy assistants, 81 qualified nurses, 8 mid-wives, and 5 laboratory technicians. They told us that they do buy a lot of medicines e.g. their drug bill is £15,000-£20,000 per quarter however, they are concerned about the many substandard drugs which they receive explaining that treatment failures due to poor quality drugs are sadly quite common and they appreciate reliable medicines from Inter Care, however small the amounts. They also outlined their ongoing need for small instruments and gloves. We were also interested to learn that the handful of HIV/AIDS patients they have are referred to Tamale (capital city of Ghana’s Northern region) for counselling, treatment and monitoring. From our 2014 visit it was particularly evident that although Inter Care’s contribution is small, it is highly valued by the Kings Village team because of the reliable quality of the medicines we send. Furthermore, the staff are very good communicators and we have an excellent working relationship with them because they are aware of the importance of the contribution Inter Care is making to the overall success of their Medical Centre. Inter Care regularly provide support in terms of sending basic medicines and dressings. Nutritional Centre – They have an effective nutritional centre which includes a compound for mothers and babies to ‘live in’ until the children are well enough to return home. Fathers are encouraged to come and stay and to bring food for their families if possible thus, giving them the responsibility of supporting and caring for their families. 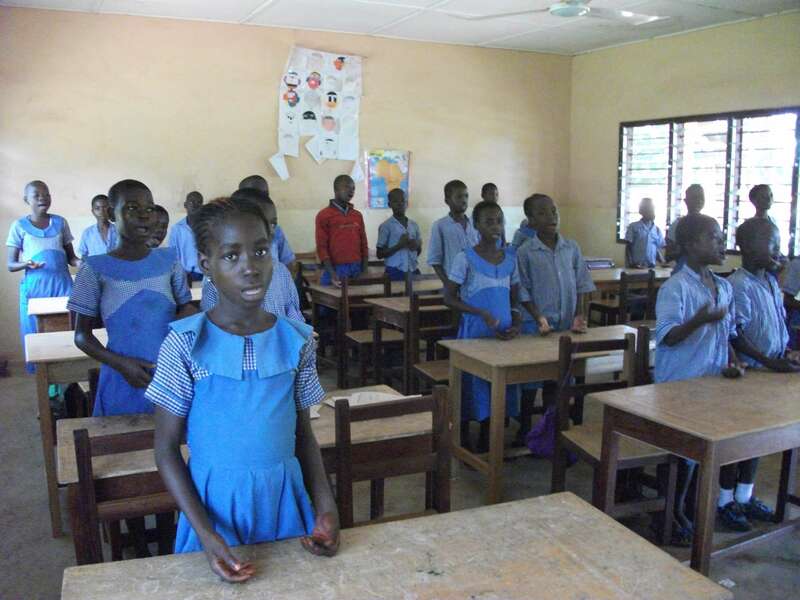 School – The school which started out with just 3 small classrooms now teaches up to 300 pupils. The catchment area is a 70 mile radius covering a 165,000 population. Ben and his team have secured school fees sponsorship from individuals and groups for over 80% of the children attending the school, the remaining pupils receive free schooling. They have also secured registration fee sponsorship from the Global Health Initiative (GHI) for 25,000 children and for 80% of the local adults. Kings Village project receives no money from government other than repayment of medical bills through the GHI. The timing can be somewhat unreliable but these repayments are received eventually. Farm – On the farm and as a result of a visit from David Purdy they are farming “Gods Way” using natural fertilisers and other associated methods. The results have been amazing i.e. where previous yields were 2.75 tons of soya per acre the improved yield is between 5 and 7 tons. In keeping with the ethos of the village, they run a pilot scheme training the farmers in the district to employ these superior crop growing methods. This hospital is large and easy to find on the main street. On a busy Monday morning in September we visited Dr Richard Wodah, Medical Director who told us about their cash-flow problems caused by the collapse of the Ghanaian National Insurance scheme, which has run out of funds. Sadly the overwhelming majority of his patients are insured by this scheme and these payments are all at least six months in arrears. Most of the hospital funding comes from the government plus a small local supplement. Dr Wodah has therefore had to be pro-active in seeking out and obtaining help from charities i.e. Inter Care, Motec and Jacob’s Well have since come to their aid. We also learn that like many areas of Africa it is difficult to recruit doctors in NW Ghana and were not entirely surprised to find that Dr Wodah is the only Doctor in this 193 bed hospital (!). Luckily for his patients, he is extremely well organised with a large team that includes 102 nurses, 3 Medical Assistants, a pharmacist, a pharmacy assistant, 4 technicians, 41 midwives and a visiting dentist and ophthalmologist. Their facilities include; an Outpatient dept. that sees 350 patients per day and a good laboratory which can perform basic tests. The pharmacy is extremely busy and is hampered by a lack of IT systems and equipment e.g. labels and records are written by hand – a slow process. 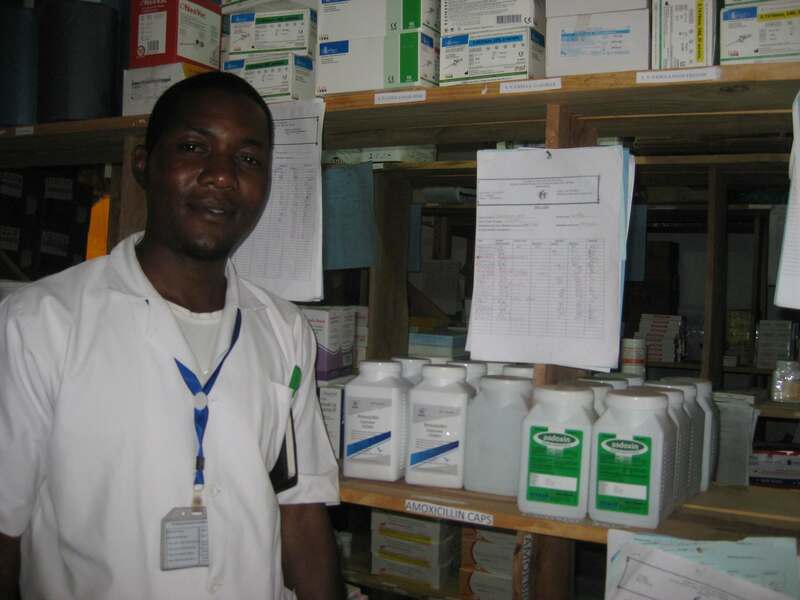 The order for medicines from Inter Care is made by the pharmacist George Dabuo who is well informed i.e. he only orders medicines with which the medical staff is familiar. On our visit, we saw clear evidence of Inter Care drugs being used to treat patients free of charge as per our working agreement. Overall, the team at this hospital are highly motivated and are appreciative of the aid Inter Care provides. For the future, as the hospital serves a large area of 101,000 plus population we would like to increase our supplies to them where possible. E.g. they especially need more antifungals plus all types of dressings and instruments. Inter Care support with bi-annual consignments containing a range of medical products including basic medicines and dressings. 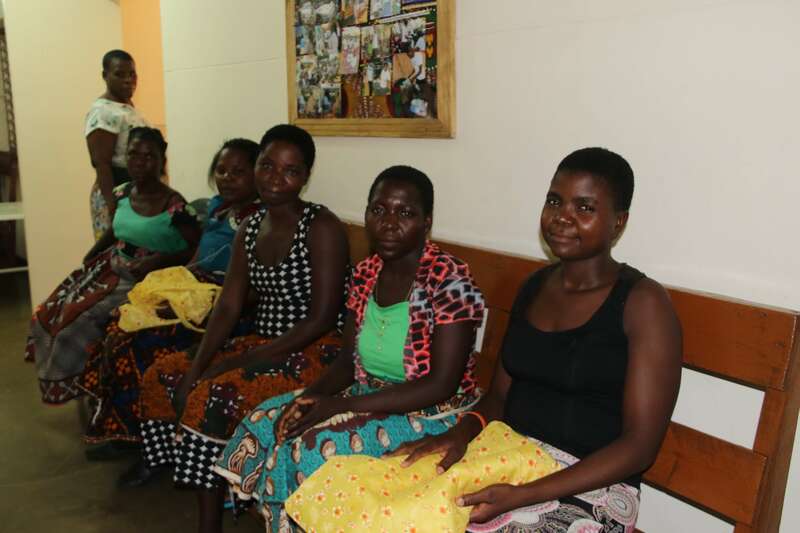 Inter Care has been supporting The Fistula Care Centre (FCC), based in Lilongwe, Malawi since 2015. FCC provides a holistic approach to the repair, care and rehabilitation of women with obstetric fistula (OF), a devastating childbirth injury. This 40-bed unit has its own dedicated operating theatre and has the capacity to treat more than 400 women every year. Their staff consist of 1 doctor in residence, 3 visiting doctors, 1 clinical officer, and 18 qualified nurses. OF most commonly occurs among women who live in low-resource countries, who give birth without access to medical help. If a woman’s labour becomes obstructed, she can remain in excruciating pain for days, in most cases the baby dies and she is often left with an obstetric fistula, a small hole created by constant pressure from the foetus. The psychological impact of OF can be devastating. On top of the emotional despair of losing a child most women and girls, due to the incontinence caused by the condition suffer further by being ostracised by their families and communities. Whilst OF is preventable and treatable, there are an estimated 2 million women suffering from untreated obstetric fistula in sub-Saharan Africa and Asia. 80-95% of OF cases can be cured surgically yet, for every one woman that receives treatment at least 50 go without (WHO). Following surgery, FCC provides patients with further support i.e. access to micro-finance, vocational training, literacy, numeracy and arts and craft classes. Many former patients join FCC’s Ambassador Programme, visiting communities to educate them about fistula and to refer women for treatment. FCC also runs a training programme for health professionals. After being treated at FCC, many of the women are successfully reintegrated back into their families/communities. With their condition cured, their newly acquired skills and increased self-esteem, the majority go on to lead happier, more fulfilling lives. 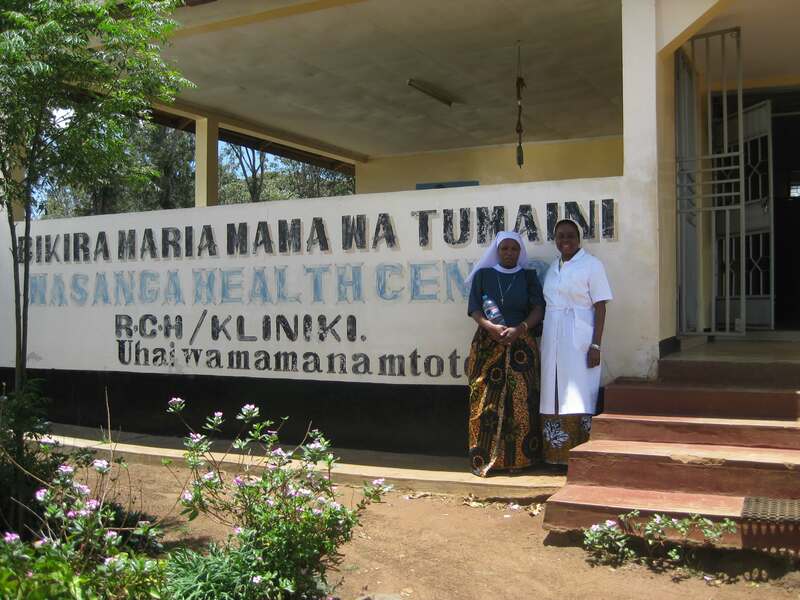 Inter Care bi-annually send medicines and fistula related specialist support to FCC. Thanks to Evan Cornish Foundation for 2015-18 direct support of FCC. St Peter’s is a 52-bed Anglican hospital. It is beautifully situated next to the historic cathedral on Likoma Island in the centre of Lake Malawi. It is a busy place run by 2 clinical officers, 1 medical assistant, 12 qualified nurses and 1 laboratory technician caring for 4,450 Outpatients and 120 Inpatients per month. Upon our visit in October 2017 we found it to be rather isolated i.e. the nearest referral centre 70km away by an infrequent and somewhat unreliable boat service. To exacerbate things the hospital boat was broken so emergency referral and the transportation of medicines is particularly problematic. We also noted a significant influx of patients travelling to St Peter’s from the nearby Mozambique coast which, effectively doubled the expected number of patients. Staff told us that the isolation issue also means that it is very challenging for them to recruit and retain staff. Despite the absence of a qualified doctor the hospital needs to be able to cope with most eventualities including surgery and encouragingly, we learned that one of the clinical officers is currently studying for a degree in mental health. Their stocks of medication are supposedly supplied by the government through central medical stores but we are told that time after time this proves unreliable. Furthermore, it does not begin to keep pace with an extra influx of patients, leading inevitably to frequent shortages. From our tour, we found Hospital Administrator Francis Vuma to be outstanding in his service to the hospital and, going forward we anticipate his advising Inter Care with local knowledge to improve the bespoke medical aid we can provide to Malawi in general. For St Peter’s Hospital Mr Vuma said “Funding for medicines and medical supplies, equipment are a challenge” Inter Care currently send consignments bi-annually which include medicines and medical supplies. 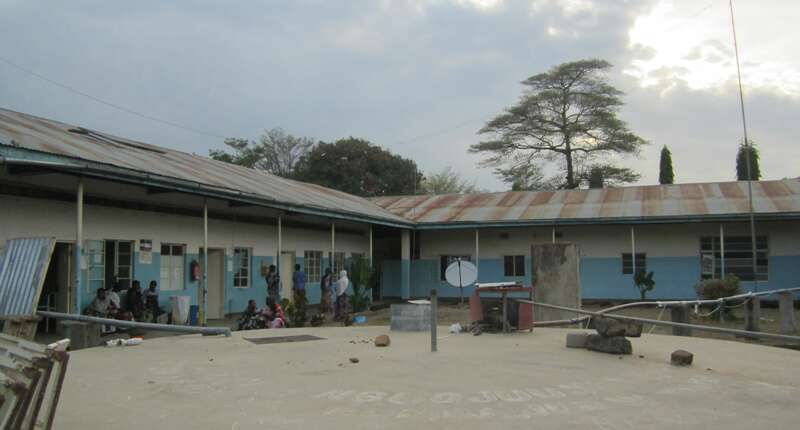 Namulenga Health Centre is located a short 35km drive from Blantyre – the capital of the country’s Southern Region. It is one of several health units run by Sisters of the Blessed Virgin Mary and was originally built in 1968 to serve a 10,000 plus population ‘without access to any other medical help’ and is served by a staff team of eleven. Namulenga has 30 beds typically used for maternity and paediatric cases and they receive between 12-33 deliveries per month. 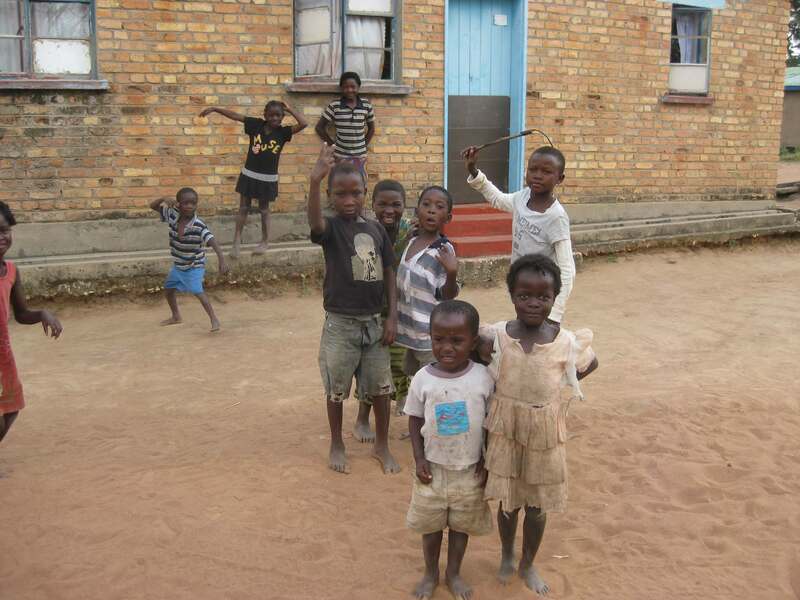 Recent extensions have enabled the development of better education and treatment for those suffering from HIV/AIDS. Between 40% – 45% of all antenatal patients are HIV positive and as such they are given Nevirapine (a medication used to treat and prevent HIV/AIDS, specifically HIV-1) at child delivery. Namulenga is proud of its Tuberculosis programme. They offer ante-natal and child health clinics at the Health Centre itself plus, the staff team make regular outings taking their mobile clinic to 20 regional villages, up to 12km away. 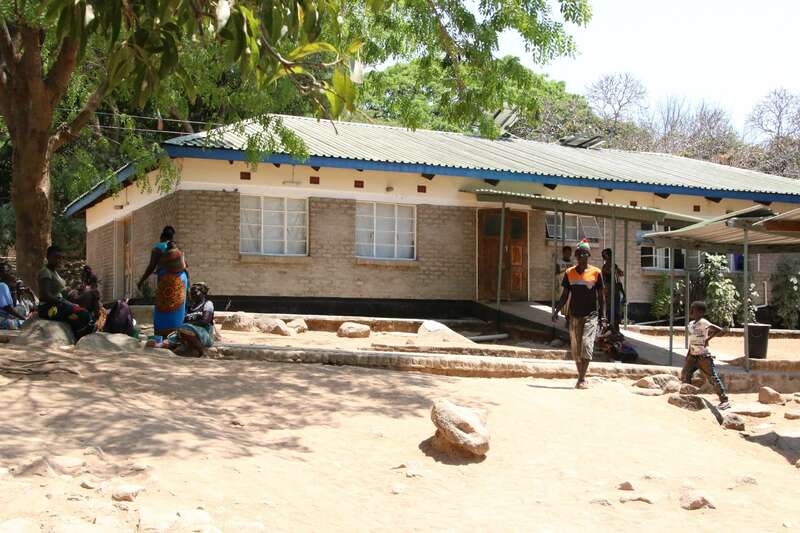 During an Inter Care visit in September 2009, it was evident to us that as Namulenga is very close to the Mozambique border 65% of their patients were in fact travelling from across the border, effectively adding significantly to the native Malawian population that they serve. They had just built a cholera block but unfortunately, like a lot of new buildings in Malawi it had no staff and therefore was not yet in use. They also had a small dental clinic and laboratory. After a further visit in September 2012, it was discovered that the clinic had financial problems and no money to buy medicines. With such a high demand and such low supplies, it is clear that the medical aid support that Inter Care can provide often proves vital. 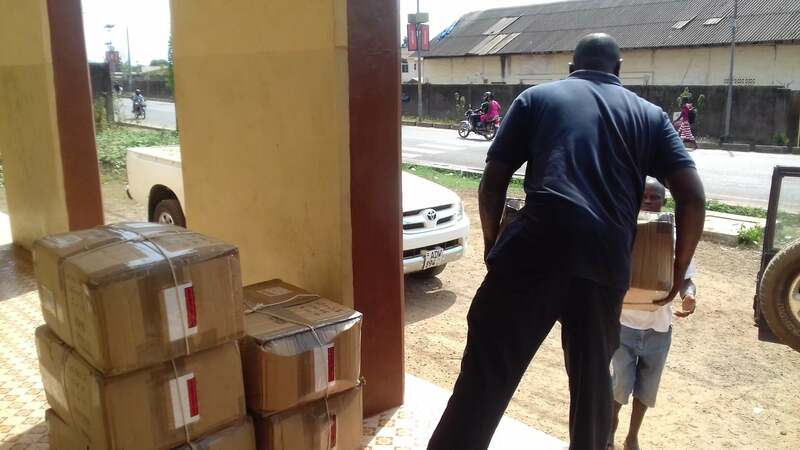 Currently, they receive bi-annual consignments containing both medical supplies and medicines. 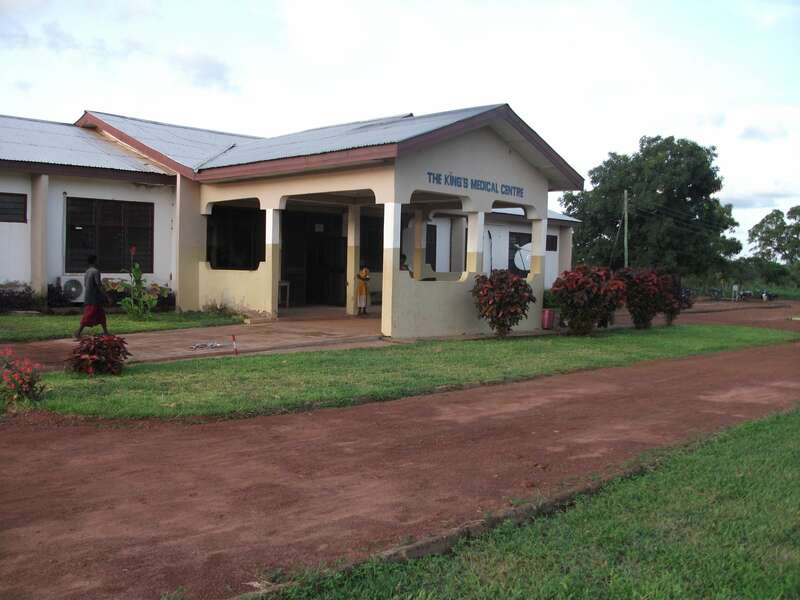 Holy Spirit Hospital is located in Masuba 55km South of the city /town of Makeni – the largest city in the Northern Province of Sierra Leone, and the 5th largest by population. Founded in 2002 this is a 75 bed facility with wards serving a varied range of needs i.e. medical, surgical, paediatrics, maternity and general. Other key features include 3 operating theatres, a Nubuliser and an X ray machine. The hospital is cared for by a total of 40 staff including; 3 resident doctors, 1 visiting part time, 1 clinical officer, a pharmacist and assistant, 16 nurses, 4 midwives and 3 laboratory technicians. In terms of amenities they have 3 ambulances and a van to help with transportation of their staff e.g. home visits. From a catchment population of 600,000 the dedicated staff team treat over 11,000 adult patients each year, of whom 2000 patients are in their teens and 4000 are children under 12 years old. Each month they treat approximately 9,500 Outpatients and look after 90 Inpatients. In the maternal wards, every month between 5-7 babies are born and take their first breathes at Holy Spirit Hospital. They have difficulties with the availability of required medicines and also with counterfeit medicines entering their supply chain, so value the quality guaranteed medicines Inter Care provide. Inter Care provide supplementary medical aid in the form of two consignments of medical products including basic medicines and dressings every six months. “Medicines received from Inter Care to Holy Spirit Hospital, always come in handy! Two of our recent patients (Sept 2018) diagnosed of Congestive Heart Failure and Hypertension respectively benefited from these donations made. Tablets of Digoxin and Lisinopril were in short supply so those donated by Inter Care were used to effectively manage these patients. Specifically, a 67 year old lady diagnosed by congestive (chronic) heart failure has been treated and discharged and, a 50 year old lady suffering from Hypertension is improving gradually. We want to say thank you to Inter Care for being party of these achievement”. Founded in 1971 as a private hospital Bai Bureh was originally intended to be a profit-making business however, following the passing of its founder the hospital became a self-governing organisation. Other than paying a lease fee to the founder’s widow the hospital now operates as a not-for-profit organisation. Located in Lunghi, across the water from Freetown Bai Bureh is only accessible via very poor quality roads. The hospital suffered serious damage during the civil war (1991-2002) and it was at one time used as a base for AU troops. The repeated firing of heavy weapons from the roof created structural damage to the building and significant leaks became a problem. Sadly, the x-ray equipment was rendered inoperable by water damage all too soon after it’s installation. Today, the hospital provides healthcare cover for 14,500 people from a relatively large 800,000 catchment that includes the airport and its workers and some people who come from nearby Freetown. With a total 25 staff including 2 doctors, 1 pharmacist and 10 nurses, 2 midwives this 52 bed hospital treats around 400 Outpatients and 215 Inpatient admissions in one month alone. 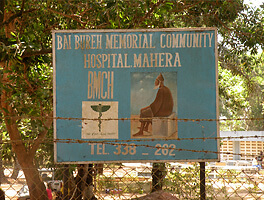 Inter Care began supporting Bai Bureh Hospital following a visit in February 2010 as we discovered their needs are truly great. Typically the support they receive is bi-annual and includes basic medicines and dressings. “Last month (July 2018) we did a C/S due to APH in which the patient developed DIC. But, it was well managed with the tranexamic acid intra IV infusion from Inter Care and the patient was saved. This medication cannot be found locally in Sierra Leone but we got it from Inter Care and we saved both the mother and the baby – Many thanks to Inter Care. When Inter Care first visited to check this unit’s suitability for support in September 2017 we found it a large health centre with 65 beds across 5 wards. Located in a very remote region next to the Kenyan border and on the edge of the Serengeti National Park, the unit is surprisingly difficult to access due to very poor quality roads. The centre has 24 fully qualified staff including 2 resident doctors, 5 clinical officers, a pharmacist and pharmacy assistant, 4 nurses and 6 midwives. It serves a catchment population of in excess of 16,000 treating 6,250 adults per year, 5000 teenagers and 1100 under 12 years. They see 100 plus Outpatients and look after almost 300 Inpatients each month. 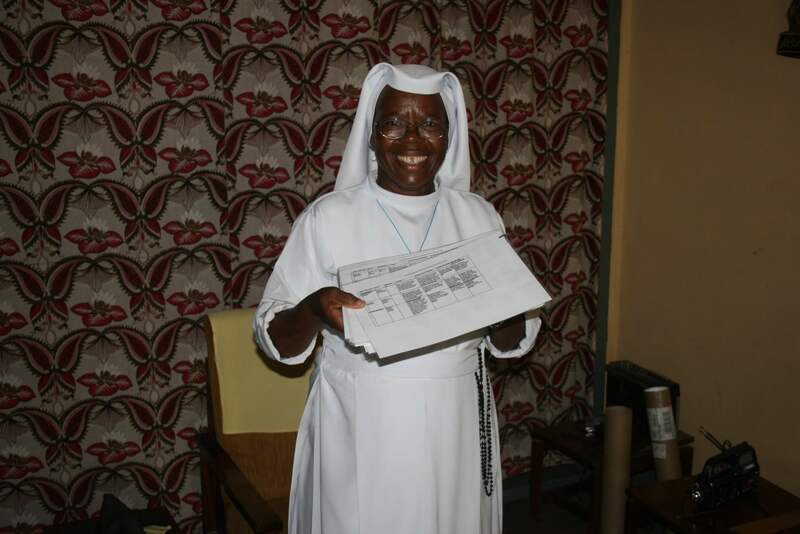 Sr Bibiane Nzali, Director / Administrator in charge of running the centre is from the Congo. We found her to be extremely driven towards delivering their health projects. She was proud of winning funding resulting in the construction of a new theatre block. It was almost complete at the time of our visit and this upgrade will enable the Health Centre to apply for Hospital status. As we toured the centre Sr Bibiane told us of how cultural issues with witch doctors and local customs are a significant issue for patients receiving treatment in this region. Malnutrition is another serious problem so, as a treatment supplement the health centre provides porridge to their overnight patients. In some months they have difficulties being able to afford to buy enough medical supplies and medicines. We concluded post visit that the health centre comfortably met Inter Care’s criteria and we now regularly support with basic medicines and dressings, in line with their specific requests. Sr Bibiane commented that “they appreciate the help from Inter Care”, adding, “ local people are really poor and need to be helped”. 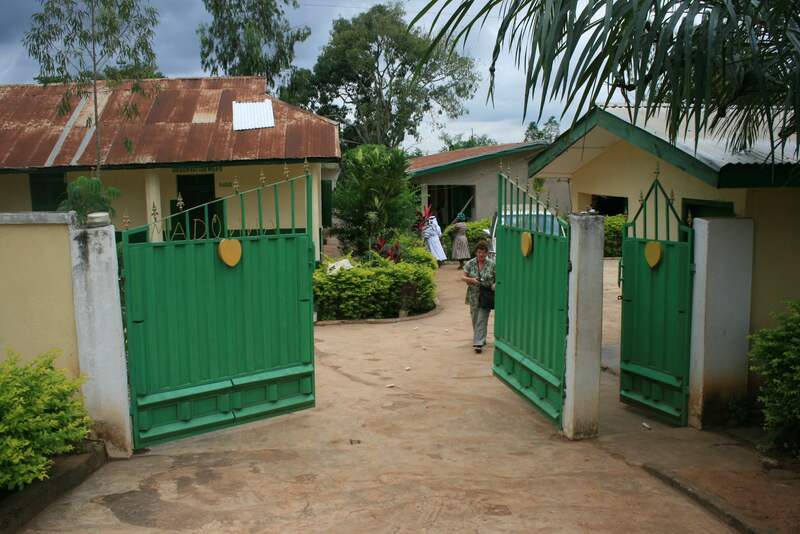 This health unit is on a main road near the Catholic Cathedral in Moshi town centre. It was started in the 1980s ostensibly as a ‘coffee-shop’ but, its true yet hidden function was a semi-official drop-in centre for individuals who suspected they had AIDS and wished to be tested discretely. 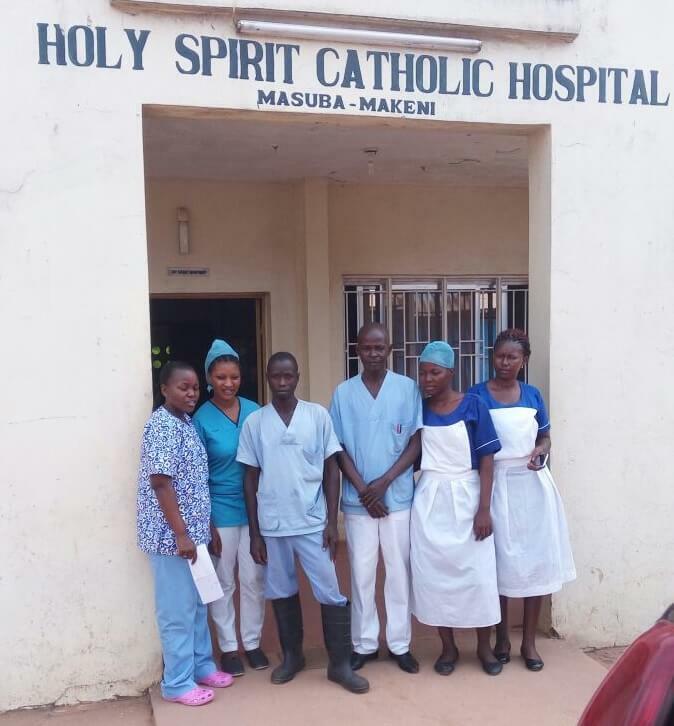 Initially run ‘on a shoe-string’ by a retired male nurse, nowadays it is run by Sr Ubaldi Kessey, staffed by the medical department of Moshi and predominantly focuses on helping HIV / AIDS patients. Patients pay 1000 TZ Shillings (about 50p) for their test, thereafter treatment is free. When Inter Care first visited we discovered staff and volunteers who are a very committed team, regularly going beyond the call of duty to help the patients they care for. During our conversations, we established that although the centre was well supported by other sponsors (who cover staff salaries) they still had a great need for quality medical supplies from Inter Care. Our most recent visit in August 2016 we saw evidence of development of their key activities; Providing health education on HIV/AIDS to the community, counselling and testing services (5-10 people per day), home bed care services, supporting orphans with school fees contributions, medication, materials, books, food, providing seed funding for small income generation activities, and the renting out of the ‘original coffee shop’ for income generation. Staff reported to us that from the local population of 267,000 spread over 25 villages, incidence of AIDs was around 5% which has thankfully decreased from 10% over the past eight years. A drought was causing further problems and they were in dire need of help, desperately in need of money for food for children in homes because sadly, some children live alone as parents/grandparents are all deceased due to HIV. Inter Care medicines that have been given free of charge in the last year (2015-16) helped a total of 233 patients. The centre’s main problem is inadequate funding. 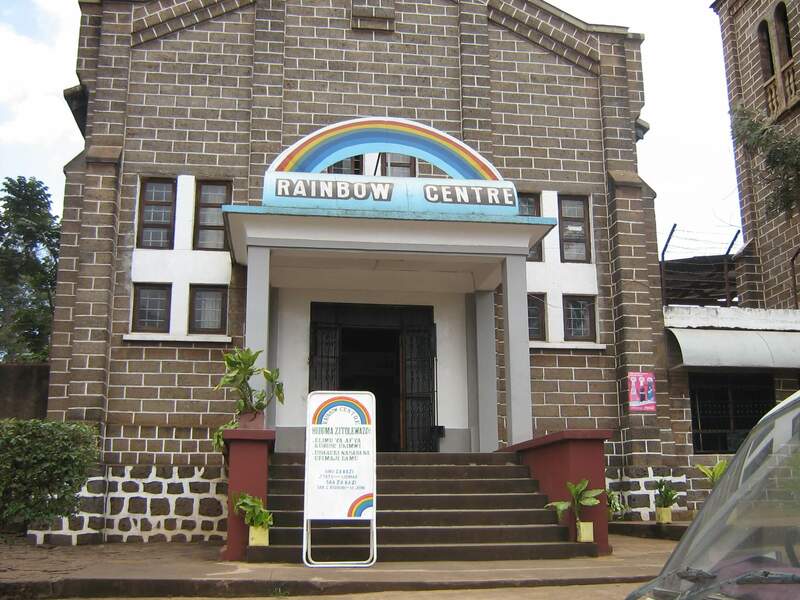 Our donation of medicines indirectly helps Rainbow Centre financially as the money saved not having to buy medicines is redistributed to their other key activities. Martha aged 43 years lives in Kibosho – a town and ward in the Moshi Rural district of the Kilimanjaro Region of Tanzania. Martha is HIV positive. On top of this she is a widow whose husband died more than a decade ago from AIDs. At the time of his death he had left no will so unfortunately, she lost the family house as by law it went back to her deceased husband’s family who did not decide to help her. Consequently, she was left homeless with 5 children of which 3 are HIV positive. The Rainbow Centre kindly helped Martha providing assistance in the form of food, school fees and most crucially helped her to help herself by donating a small grant which Martha used to buy a goat and equipment to brew banana beer. 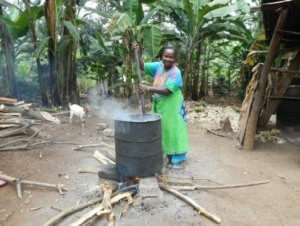 With the income Martha has raised from her business, at last she is now able to build her own home. 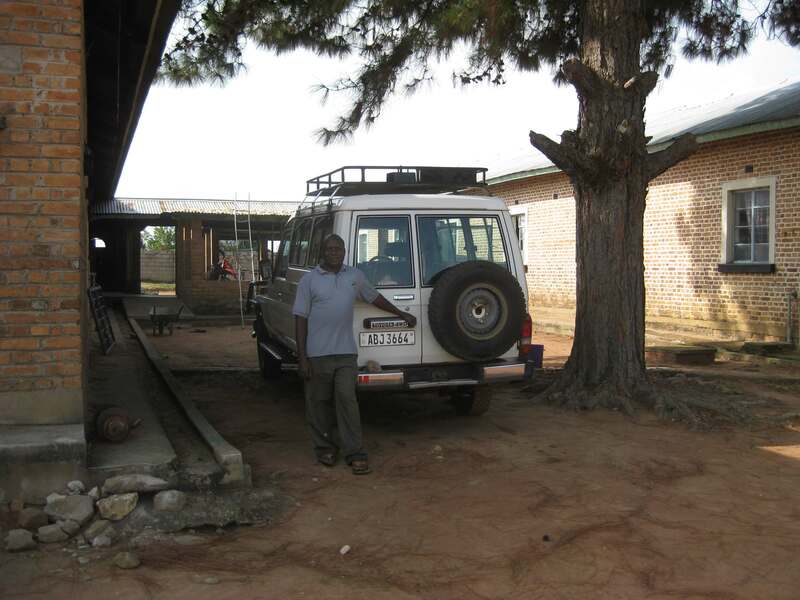 Kibara is a small rural hospital in a poor and deprived area. It is situated on a peninsula jutting out into Lake Victoria and is accessed by a 4 hour drive from the nearest city, Mwanza. The hospital has 102 beds spread over its five wards serviced by 51 staff including 2 resident doctors and 16 nurses. They treat in the region of 400 Outpatients and care for 200 Inpatients each month. We find the key challenges faced by this hospital are similar to those faced by so many other partner health units Inter Care support – funding and infrastructure. Kibara seriously lacks adequate and regular funding and has ongoing problems with its electrical supply. This was very evident to us when shown around wards with no lighting – we couldn’t really see what we were being shown (!). Staff bluntly explained “this is due to the cost of workers’ salaries and the Government failing to finance as was previously promised”. Their medical needs are predominantly for antibiotics, which are in short supply due to the prophylactic treatment of HIV/AIDs patients, and them not being effectively supplied by the Government. In this part of the world hospitals have to pay excessive prices for their healthcare goods e.g. a single bandage cost £13. We know from experience that catheters and surgical equipment are also very expensive to buy in Tanzania and they too are much needed by this Hospital. Overseas visits like these confirm to Inter Care’s management that our targeted medical aid is directly meeting local needs. 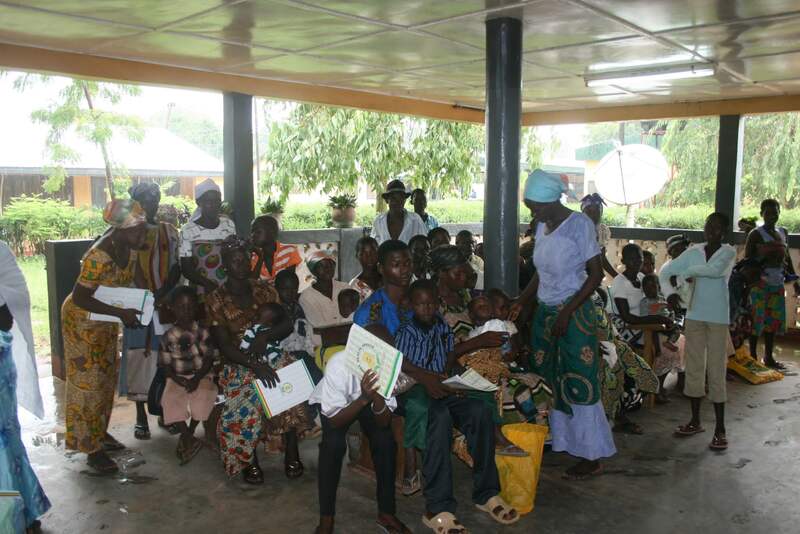 Kibara continues to receive bi-annual consignments of aid to supplement their needs. 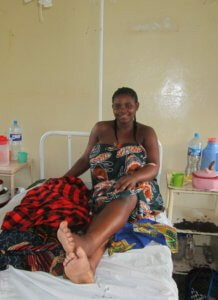 Mercy is a 16-year-old young woman, who lives 20 km from Kibara Hospital. 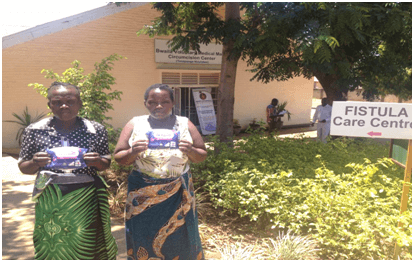 During her recent pregnancy she attended her local dispensary initially for her antenatal care, but then had to be admitted to the hospital for the childbirth. The good news is that she had a healthy baby boy weighing 3kgs who is doing very well. The bad news was that she was suffering from pre-eclampsia – a condition which pregnant women can develop and is marked by high blood pressure in women who haven’t had high blood pressure before. Although Mercy went to full term her blood pressure was so high: 200/120++ that even 4 days post-delivery her blood pressure was still raised, also she still displayed significant oedema particularly around her ankles. 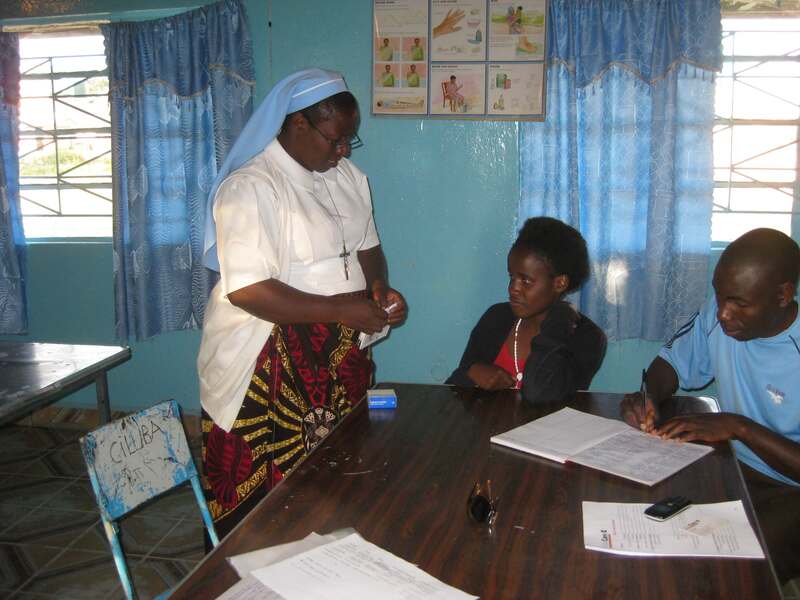 Kibara, to help young pregnant women just like Mercy. 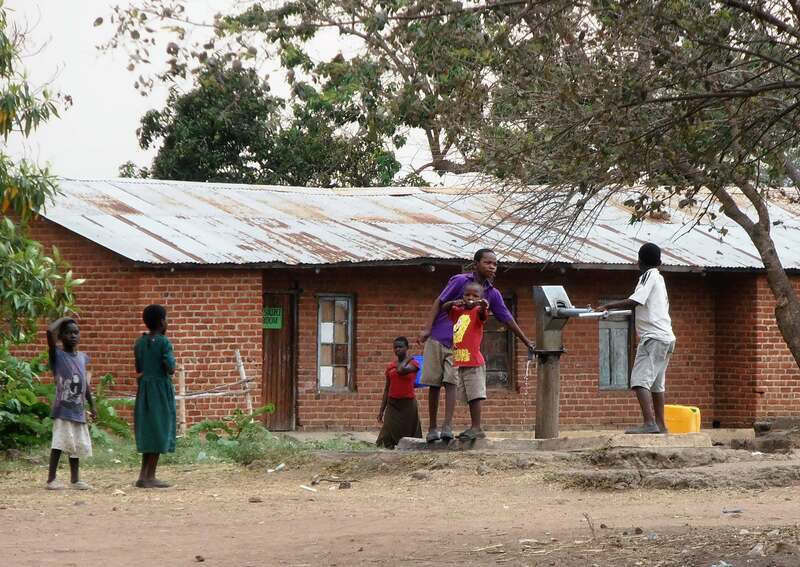 Kayambi Health Centre is situated in the north of Zambia in a very remote area with no electricity or water supply. It has a population catchment of 15,300 however, patients also frequently visit from outside the area. The centre sees approximately 2,100 Outpatients and 365 Inpatients per month. 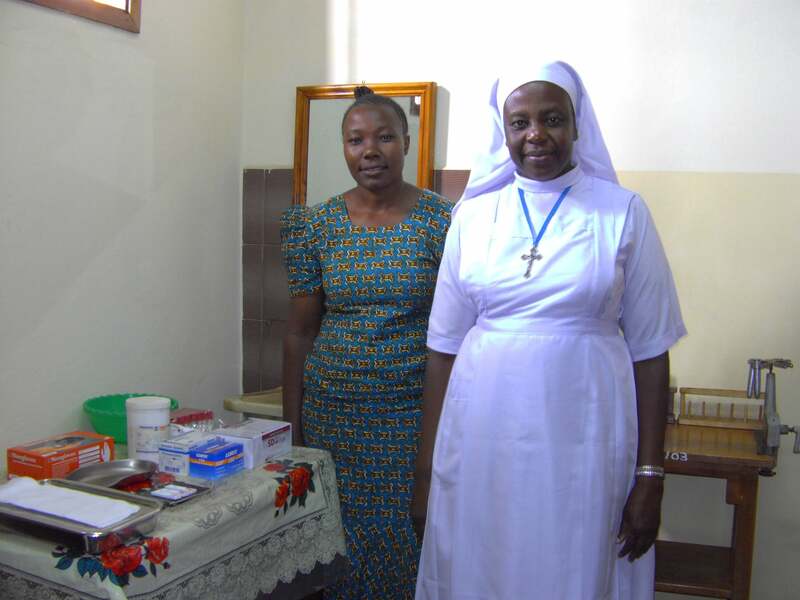 When Inter Care last visited the health centre was run by Sr Clementina, who was pro-actively engaging with local government on weak infrastructure issues such as improving roads and the lack of electricity in the area however, she has now retired. Now run by Sr. Banda the health centre has a degree of self-sufficiency – benefiting from its own solar panels which supply only enough electricity for most of their daily needs but barring evening and during the night. Also on site is a small farm where they produce most of their own grain requirements. Inpatients are treated in 66 beds over 5 types of wards although frustratingly, they don’t use the twenty beds in the isolation ward as they cannot afford to run it. The staff team is 3 clinical officers and 4 qualified nurses, two of whom are midwives who have to cope with the workload, which includes supporting 10 outreach clinics as far as 80km away. The nearest referral hospital is in the city of Kasama – 150 km away on roads that are impassable in the rainy season. Upon Inter Care’s last visit we witnessed just how remote and how needy the health centre actually is – the experience left a lasting impression in all our minds! They told us how despite them being registered to receive medicines from the government, this supply is often withdrawn if somewhere else has a ‘greater’ need. We saw how supplies from Inter Care are kept in a separate storeroom and were told they often need to use them as they are so desperately short of their own. 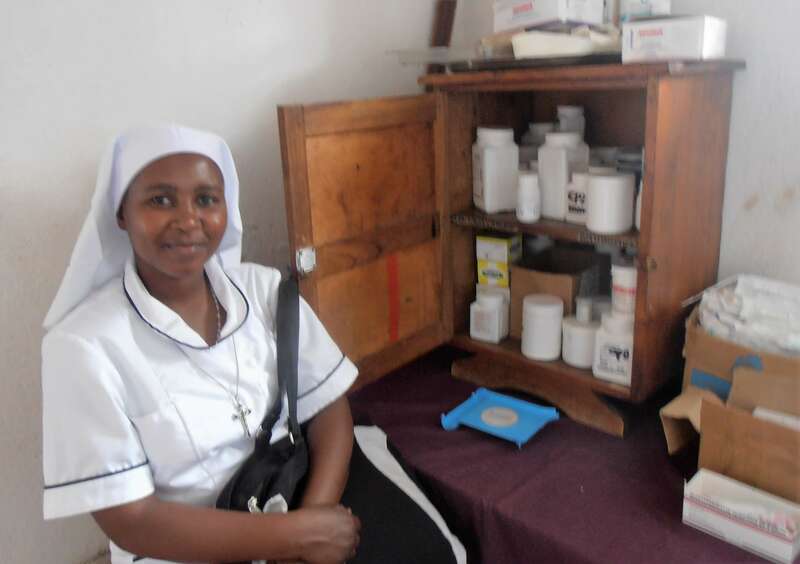 Kayambi bi-annually receives medical products including medicines and dressings from Inter Care Sr. Banda commented “We really appreciate the service you are rendering to these vulnerable people living in hard to reach areas”. Inter Care are particularly grateful to Quorn Church for directly supporting this clinic. 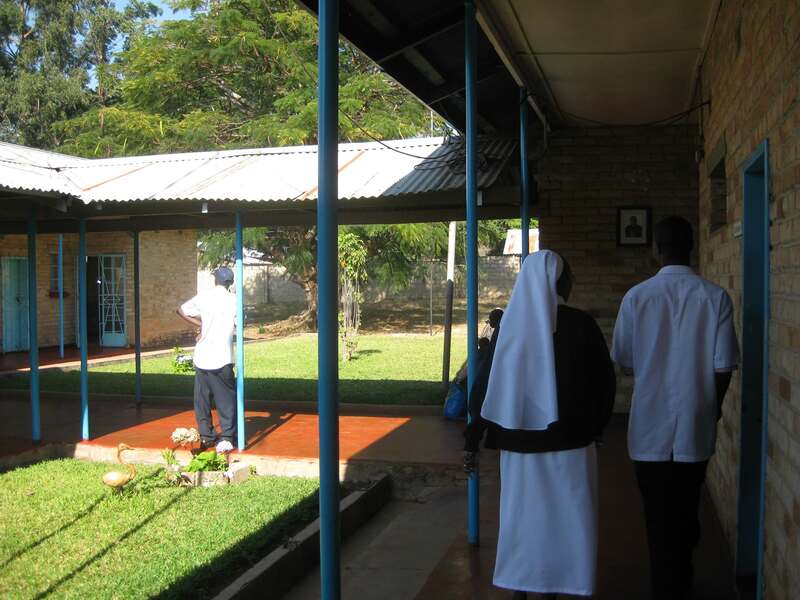 St Fidelis Hospital is found in the Archdiocese of Kasama – a large city in Northern Zambia. The hospital is situated at the end of a ‘particularly uncomfortable’ 45-minute drive from Kasama over some very rough roads indeed (!). 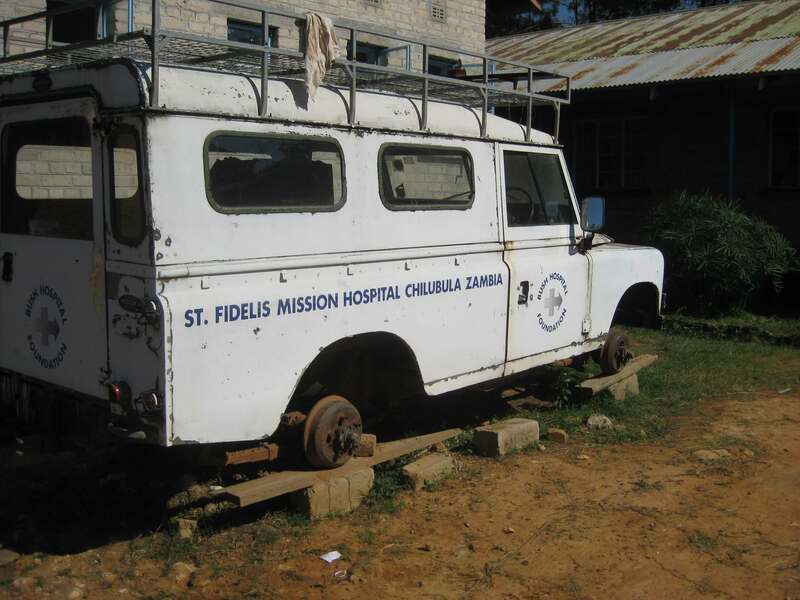 St Fidelis is part of the small community of Chilubula which, in addition to the hospital is comprised of a church, a convent and a school. The hospital serves approximately 14,500 people, the remotest of whom have to travel up to 80km to see a nurse or doctor. In addition, many other people travel to St Fidelis Hospital from outside their catchment area for treatment. 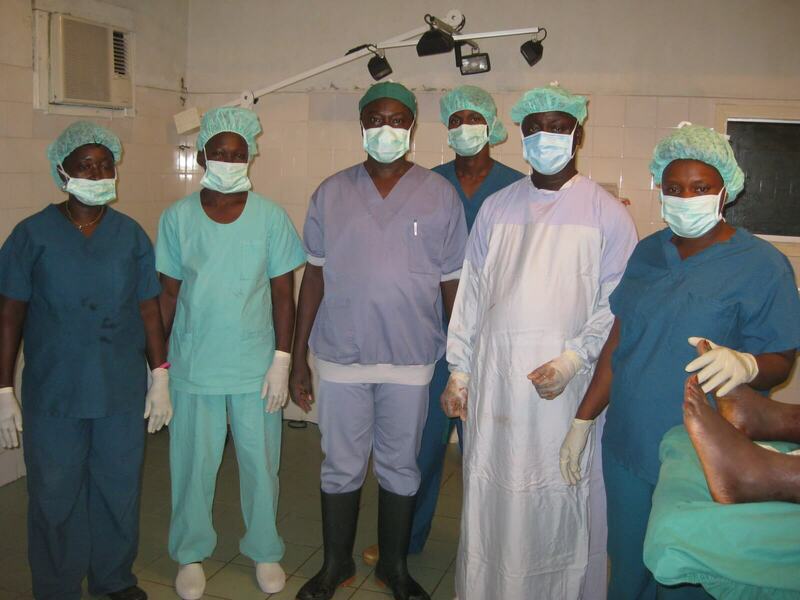 On our last visit, we found they had recently finished building a new operating theatre and opened a dental clinic. The hospital is efficiently run with a pervading sense of discipline and order by Sr Elizabeth Chanda and staff consisting of 2 doctors, 7 clinical officers, 1 medical assistant, 1 pharmacy assistant, 16 qualified nurses, 5 midwives and a laboratory technician. Owing to both the long distance (35km) to the nearest referral hospital (Kasama General) and the appalling state of the Zambian roads, between them this team deal with all but the most serious cases. The hospital has 100 beds over 6 types of wards – Female, Medical, Children, Maternity, High Cost and Casualty. They receive between 20-40 stock deliveries per month. They also support four out-reach clinics up to 40 km away. They showed us their well-equipped laboratory. They explained that they aspired to offer 3 meals per day unfortunately; this was not always possible simply due to lack of finances. The other challenge the hospital faces includes the distance required to access and purchase medicines plus the high prices that are charged for them. Inter Care medical supplies contribution made up 40% of their medical needs which are clearly significant e.g. they had not long received a consignment from us when we visited however, all of the paediatric syrup and creams had gone in the first two weeks! 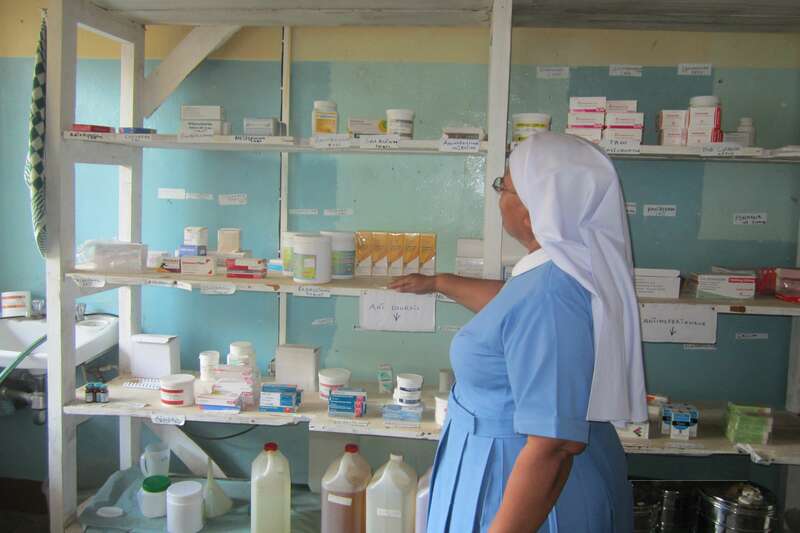 Inter Care continue to supply medical aid such as basic medicines and dressings on a bi-annual basis. 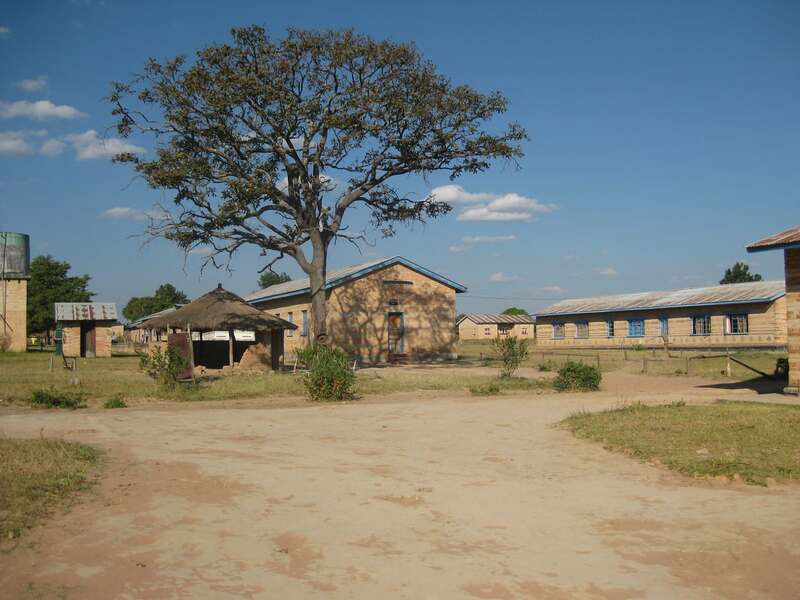 Mporokoso School, founded in 1961 is very remotely situated 185 km from Kasama (a large city in Northern Zambia). When driving from Kasama it can take a full days travel to reach the school because of the poor condition of the roads. Upon your eventual arrival, you may be greeted by up to 172 students. These are children who are all either blind, partially sighted or with albinism (50% sighted) and are looked after by Sr Hilary, the headmistress of the school. These young people face a unique life challenge – i.e. many of the children suffer from sunburn due to the lack of pigmentation in their skin and obviously there are a large number of eye diseases. A large proportion of the children have been left blind or with failing sight as a result of living in the Kapata region where many eye infections are easily picked up from the lake water. The school makes all its own Braille books by translating textbooks and reading books including an edition of the bible. Key staff S. Charity and Mr Wilson treat any and all of the health problems encountered by the children and their families in the immediate area. When Inter Care staff last visited we saw and even joined in with some of the class activities, such is the amazing work of the school and the teachers there! Our staff remarked afterwards “The children have such an air of confidence about them” and “we could see in person what good work is being carried out there” With medicines being very costly and located such a great distance from the school Inter Care supply 100% of their medical needs and continue to do so.